In early autumn, I ventured over to the less frequented north side of Mt. Hood for the weekend. Specifically, to the Cloud Cap Inn and Tilly Jane historic areas. This area is rich with historic buildings, alpine trails leading to the glaciers, a small meandering creek and incredible views of the valley below. On this excursion, the Cloud Cap Inn was the main destination for our group. Cloud Cap Inn rests at 6,000 feet near the Eliot Glacier and was originally built in 1889 as a high-end mountain resort. After years of closures and ownership changes, Cloud Cap was purchased by the U.S. Forest Service in 1942. Not knowing what to do with the building, the Forest Service considered tearing it down altogether in the 1950s. 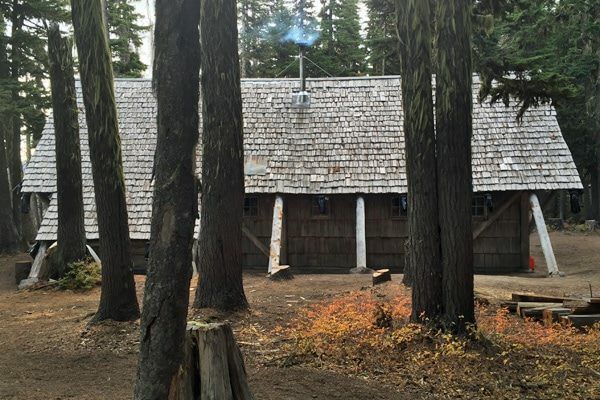 That is when the Crag Rats, the oldest search and rescue group in the U.S., stepped up and made a special agreement with the Forest Service to care for the building, while continuing to use it for search and rescue operations on the mountain. The Crag Rats are proud of their organization and view Cloud Cap as a part of their history. Over the years they have put a lot of hard work and money into restoring and maintaining the old Inn, which is now listed on the National Register of Historic Places. While it isn’t open to the public for nightly visits, the Crag Rats and Forest Service do periodically provide day tours inside during the warmer months. Hikers can still enjoy the grounds and the exterior appeal of the buildings year-round. On this particular visit, I had the rare opportunity to stay in the Inn with some Crag Rats for the weekend. We were doing some routine maintenance and training. Stepping inside, I was instantly drawn to the originality of the place. It was like walking into a replica inside of a museum. I was hesitant to touch anything at first. The wooden floors and ceilings creaked under our boots as we moved our things inside. Wind rattled the multipaned windows as we removed the steel covers on the building’s exterior and opened the place up to let it breathe. 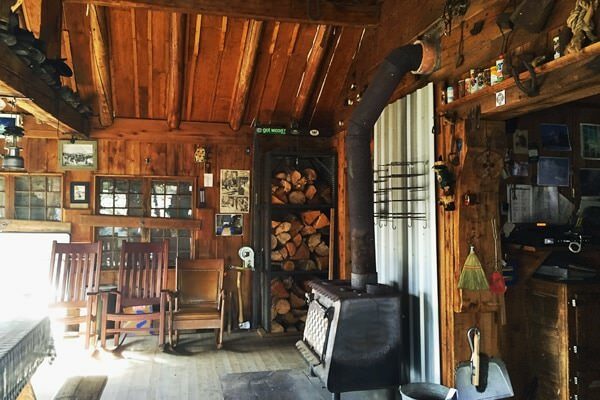 The cabin retains its original aesthetic, with decades-old photographs and notes covering the walls, two old fashioned wood burning stoves warming the rooms and mountain rescue gear and books filling the shelves. I was happy to see a fully operating kitchen with an oven and a flushing toilet and warm shower in the small bathroom — modern updates that provide small comforts without taking away from the feel of the place. The large stone fireplace in the main hall is what really caught my eye. Flanked by large windows and bunk beds, it makes the entire place cozy and comfortable. 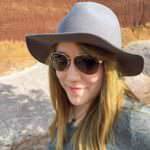 During our visit, in between our work, my friend and I explored some of the surrounding trails. The first night we set out around 4 p.m. to see if we could make it up the ridge to the glacier. Unfortunately, we didn’t make it all the way, but we did get amazing views of the area. And lucky for us a warm bowl of chili was waiting at the Inn when we returned. The next morning, I woke up on one of the bunk beds next to the large stone hearth as first light began creeping through the large windows. I could just make out the top of Mt. Hood through the thin clouds. My friend and I got up and quickly set off again to explore the Tilly Jane Trail. This trail connects with the Timberline National Historic Trail that circumnavigates the mountain. That particular hike is a long and intensive one, so we decided to just stick to the main trail. This lead us through the Cloud Cap Saddle Campground and along Tilly Jane Creek. The area was scorched by a forest fire in 2008, leaving behind a sea of charred pines. To me, the contrast of white and black pillars against soft tufts of gold and green grasses only adds to the allure of the place, presenting a vision of the tension between life and death that is so familiar in the wild. 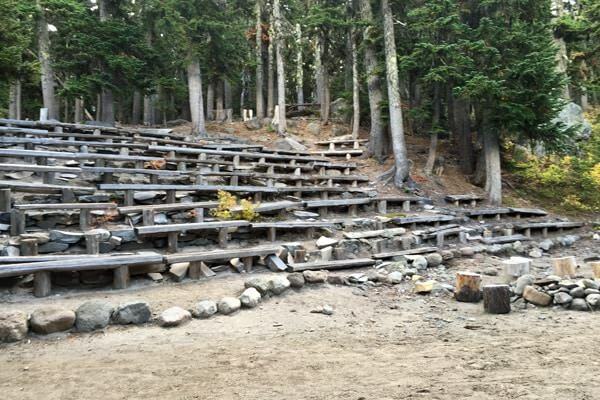 We came across an old wood amphitheater and the Tilly Jane A-Frame here as well. The old A-frame was built in the 1930s, and unlike Cloud Cap, it can be rented on a nightly basis year-round. 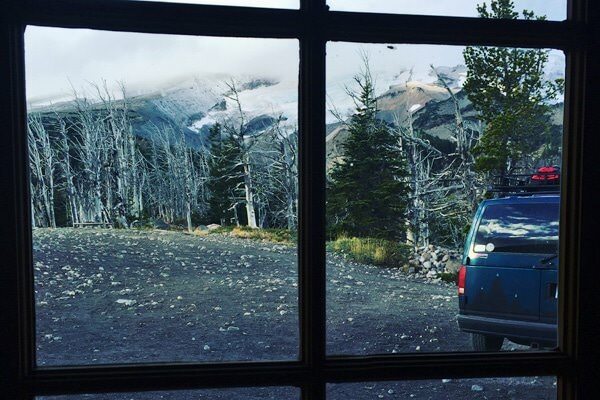 When the snow begins falling, the Forest Service closes the roads, but all of these spots can still be reached on snowshoes or cross-country skis. Imagining the area blanketed in white, I am eager to go back to see it all again with a fresh perspective. This is the kind of the place where there is always something new to see.